Ireland has become a haven for surfing in recent years. From Carrowniskey to Mullaghmore, the Atlantic Ocean is serving up killer waves along the Irish coast. To take them on, you’re going to need a wetsuit. Here’s our guide to grabbing the perfect one. The ferocious Atlantic Ocean has made Ireland one of the best surfing spots in Europe. In order to take on the waves, you’re going to need a wetsuit – this isn’t Hawaii, sadly. Buying your first wetsuit can be an intimidating prospect. To the untrained eye, all that neoprene looks the same. Fear not, we’re here to run you through the difference between flatlock stitches and liquid seams, 2mm or 5mm, neoprene and polypropylene. In Ireland, the water temperature is only going to get into double figures between June and August. The rest of the time, it’ll be anywhere between 6-10°C, which is pretty chilly as things go. For that reason, you’ll need one of the thicker neoprene suits on the market. Thickness starts at 2mm and goes up to 6mm, and varies in different parts of the suit. The suit will be thickest around your torso, as it is most important to keep your core warm. Legs are next, followed by the arms. In the past, thicker wetsuits have generally led to less mobility, however, the developments in recent years have greatly improved things so that you will barely be restricted at all if you go for a 5mm suit. If you’re planning to venture into the Atlantic in the winter months, consider getting at least a 5mm suit — it’ll extend your stay in the water. If you’re more of a fair weather surfer, then a 3mm suit will do the job. It may not sound like much, but you will notice the difference in thickness as the seasons change. Most seasoned surfers tend to have a suit for every occasion, but if you can only stretch to one, then lean toward the thicker suits. You may be a little warm in the summer, but you’ll be grateful in the Autumn and Winter. You’ll quickly know if a wetsuit doesn’t fit. With newer suits, chafing is becoming less and less common, but that will be little comfort when you’ve got raw skin on your neck, knees, or worse. If your suit is too loose, then you’ll have to deal with flushing. Flushing is when cold seawater finds it’s way into your suit. Neoprene suits work by trapping a layer of water between the material and the skin, this is warmed by your body heat and keeps you cosy. If sea water is constantly coming into the suit, then you’ll struggle to stay warm. One thing to keep in mind when trying suits on is that neoprene loosens when wet. A well-fitted suit should be close but not suffocating. Make sure that it touches your skin in every nook and cranny, from the small of your back to the back of the knees. There are three main types of wetsuit: Steamer, Shortie, and Long John. The final two allow extra mobility but at the cost of warmth. The Shortie has short sleeves and legs and is only really suitable for the few hours of sunshine that is the Irish summer. The Long John has full-length leg coverage, but is completely sleeveless. It was designed with sailing watersports in mind, so shouldn’t really be considered for surfing. The Steamer design is the most common type of suit and the one you’ll spend most of your surfing life wearing. 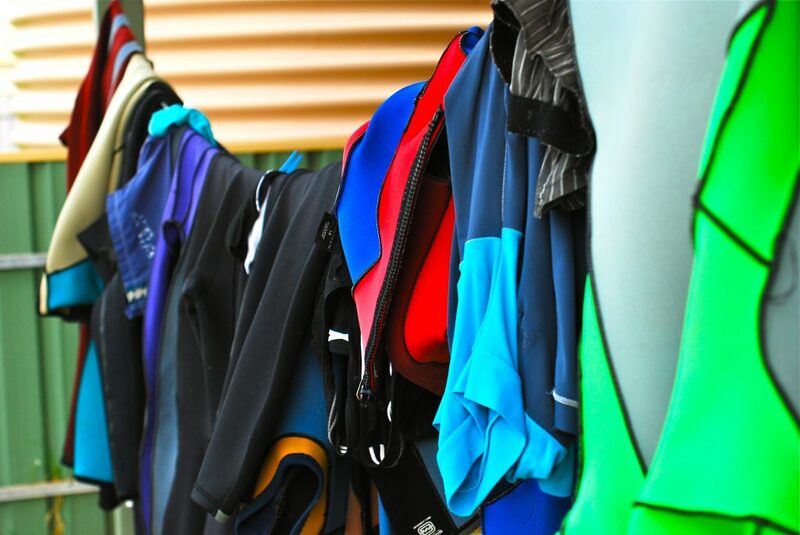 When looking at Steamer wetsuits, you’ll also be confronted with a variety of zipping options. Back zips will run along your spine, which creates a big opening, making it the easiest type to get on. However, the seal around the neck is looser and you’ll get flushing through the length of the zip, so it will be less insulated as a result. It can also impede paddling as the zip reduces the flexibility between your shoulder blades. Chest zips solve a lot of these problems. They run between the shoulders and fall just below the collarbones. The smaller entry will make getting ready a little less graceful, but will keep you warmer and your arms will be less restricted. Front zips are generally more expensive than back zipping suits, but for surfing in the winter months, the extra investment is worthwhile. Finally, there are some suits that are completely zip free. They can be pretty challenging to get in to and even harder to get out of, especially if you aren’t as flexible as you once were. On the upside, these suits are the most flexible available and form an excellent seal once on that’ll keep you warm. However, the extra strain put on the suit while entering and exiting it can mean these suits don’t have as long as life as zippered alternatives. Wetsuits take care of the majority of your body but still leave your extremities exposed to the elements. Thankfully, manufacturers have a range of products to help you. Gloves, hoods, and boots (often called booties) are all available to help extend your stay in the water. Use of gloves and boots are down to personal preference. Boots will keep your feet warm and offer protection against rocks but you may lose some feel for your board. Gloves will keep you paddling for longer, but some of the gloves with mitten design may make it difficult to grip your board. Hoods are only really necessary in the depths of winter. With much of the body’s heat lost through the top of the head, covering up can make the difference between a quick dip and an epic session. Don’t look to save money on your main suit by investing in boots and gloves. The body prioritises keeping the core and brain and warm and so should you.